He put his own signet ring on Joseph’s hand and dressed him in garments of fine linen and put a gold chain round his neck. So Pharaoh set Joseph over all the land of Egypt. 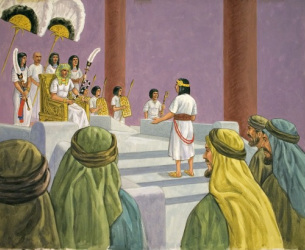 Not only was Joseph elevated to a position next to Pharaoh himself but Pharaoh also gave Joseph the daughter of Potiphera, priest of On, as his wife. (Genesis 41:45) Pharaoh was a wise king. He recognised that Joseph has the Spirit of God in his heart and so Joseph never returned to the prison house. We don’t see the future and often our plans don’t turn out as we would wish. But God sees and plans for the future and what he plans always comes to pass. Do you recall the dreams God gave to Joseph when he was with his father and brothers, how in one dream he was in a field binding sheafs when his sheaf stood up and his brothers bowed down before his, and how in another dream the sun, the moon and the stars bowed down before him? In the next episode we shall see if these dreams come true. As Joseph said, first there will be seven years of plenty and so it turned out. There were good harvests and plenty of food. During those years Joseph took control of collecting and storing all the grain and stored large amounts in preparation for the famine. Famine is a dreadful thing. If people can’t get food they grow thin and weak and eventually they die. So Joseph supervised all the land of Egypt and collected grain from everyone to store for the coming famine. Question 1. Do you think that Joseph did forget all about his father and brothers? Question 2. Why did Pharaoh appoint Joseph over all the land of Egypt?